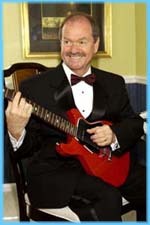 "Wedding Entertainment - Solo Guitar & DJ Services - Will Roberson Entertains"
Will has performed for literally thousands of weddings, conventions, and live concerts. We will continue to add "wedding dates performed" as each year begins anew. This information is included to name the wedding couples, their wedding dates, and their place of residence or where their event was held when they hired Will Roberson to entertain for one of the most important events in their lives!